We all know by now that a good story, which makes sense to your audience can really grab their attention. 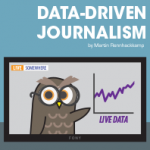 I have previously advocated “storytelling in data science” and gave pointers how to do this effectively in “tale from the woods”, but now we’re seeing the data-driven story-telling taken up in full-scale journalism – which is certainly an interesting move. The trend labelled ‘Conversations with data replace static dashboards’, indicates that data (especially graphs and visualisations) are becoming much more “active” – meaning it’s no longer useful to present a graph as a passive picture, but it has rather become a dynamic medium that can be interactively used to tell a story. In a way it is like upgrading from passive picture comic books to animated movies. The second trend entitled ‘Data and journalism complete their merge’, highlights that these “live data stories” are starting to play a more important role in journalism – which is a great trend to make journalism more “live” and interactive. The weather guys have actually been getting this right on TV for a while – have you noticed how much more interesting and informative an animated synoptic chart is compared to the static version in the newspaper? In fact, the Tableau paper references a great case study, which highlights the combination of these two trends perfectly. Journalist, Sarah Riley, who is based in New York, started using Tableau’s interactive visualisations to analyse all her data. While reading through the case study, what interested me the most was what she learnt during this process and how it helped her with her daily tasks on the job. What’s really interesting is that she indicated that while compiling various graphs for her data, it didn’t take her very long; and in fact it helped her get through all her work a lot faster – saying that it was really quick and also assisted her with some data administration tasks. This illustrates the power of visualisation as a data discovery and analysis tool. Additionally, Sarah commented that most of her ideas for stories and articles come from the data that she analyses – as it allows her to look at how the information shaped up and how it leads her in a certain direction for her story compilation. This illustrates data visualization as a useful method to make sense of large volumes of data, discover trends and trace other stories encapsulated in the data. So what can be taken from this? Well as we know, data visualization tools like Tableau provide you the capability you need to explore and analyse the data. However, having the ability to analyse the data doesn’t mean anything if you can’t get a story from the data, or conversely too, if you cannot get access to the data you need to illustrate a certain story. To do this successfully you need to understand what the data represents, and you need to understand it’s domain well enough that you can recognize a story when it manifests itself. To my mind the real game changer will be when more journalists (like Sarah) start to analyse and understand the value of data – to actually help create and write stories that are truly data-justified and factually illustrated and therefore of more interest to their readers.